A few weeks ago I interviewed actress Ari Gaynor at a press junket for Celeste and Jesse Forever (a hilarious yet melancholy yet poignant romantic comedy written by Rashida Jones and Will McCormack, coming out August 3--run, don't walk to the theater!) and she gleamed in a blue silk button-down blouse and red wide legged pants. The color-blocking effect was totally inspirational movie-star chic. 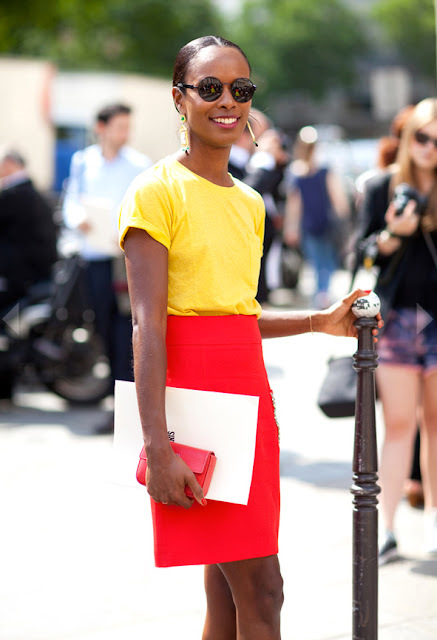 Shala Monroque, the fashion consultant and magazine editor pictured above, also gets it right with her vibrant summer-perfect combo of yellow and red--two colors I did not think went together until now. The best thing about this look is that it employs basic but bright wardrobe staples, so no tricky styling techniques are necessary. Go forth and color block! I never would have thought to pair these together either! Looks great on her!